Display your various products on shelves that are held up by these Metal Slatwall Brackets. Measuring 10 inches from the wall, this Bracket will easily hold boards and planks to make beautiful shelves. The shelves that these will hold up will provide a huge amount of extra space on your Slatwall that you can use for whatever you want to display. 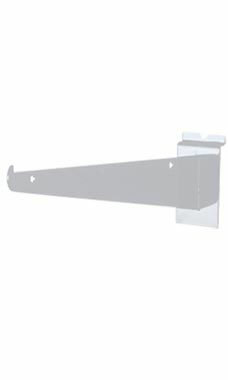 These brackets come in a sleek white finish that looks great with any store fixture. In stock and available for immediate shipment. Brackets are easy to use and hold shelves great. I trust these brackets to hold up all of the product that I put on the shelves they are holding up.